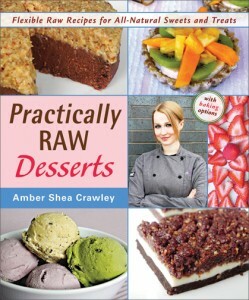 Practically Raw Desserts by Amber Shea Crawley is filled with easy recipes for scrumptious cakes, pies, cookies, brownies, puddings, candies, pastries, frozen treats, and more. 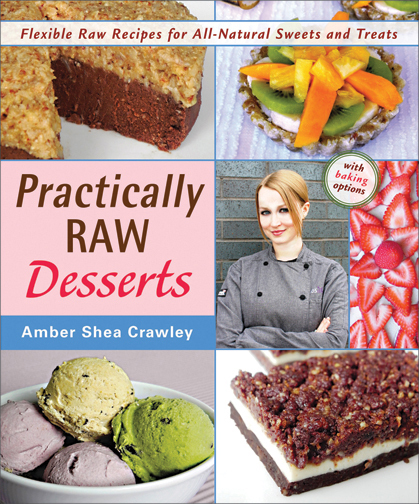 Chef Amber Shea’s raw treats are totally free of dairy, eggs, gluten, wheat, soy, corn, refined grains, refined sugars, yeast, starch, and other nutrient-poor ingredients. Many recipes are also free of oils, nuts, and added sugars. The title “Practically Raw” is a play on words, as Amber’s recipes are practical because they’re easy to make and don’t require fancy equipment or weird ingredients, and they’re practically raw because directions for using an oven are included where applicable for those who don’t have dehydrators. Most recipes also list ingredient substations, recipe various and chef’s tips. 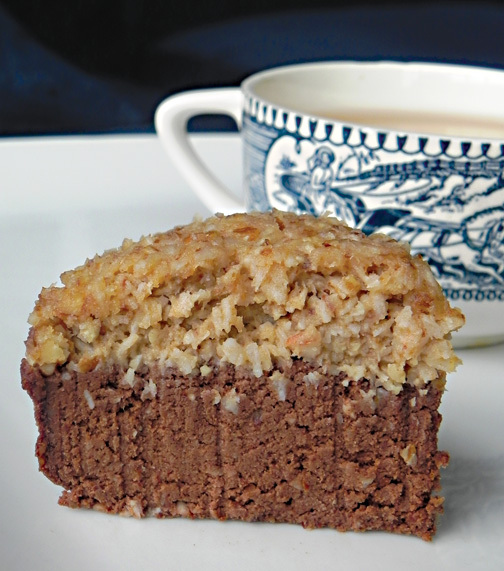 The recipes are easy to follow and don’t require to much time to make, so they’re great for raw food newbies and people who say they’re not good at baking, but they’re interesting and creative enough for kitchen veterans to enjoy. 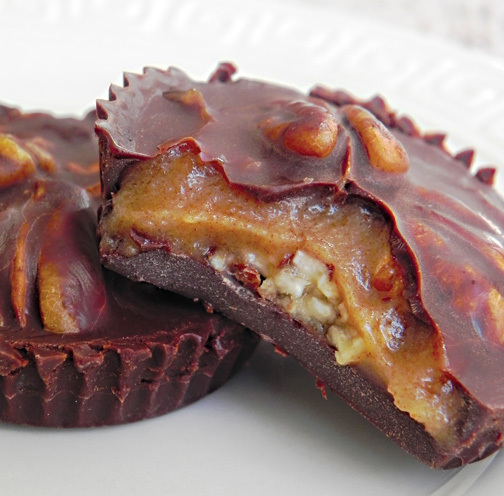 If you think raw “baking” is just for hot summer months, think again! 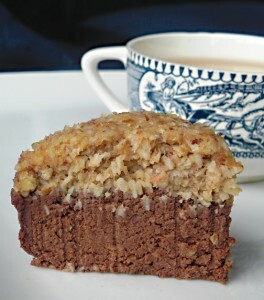 There are plenty of drool worthy fall treats in Practically Raw Desserts, such as Deep-Dish Caramel Apple Pie, Pecan Chai Spice Bars, Austrian Sacher Torte, Dark Chocolate Truffle Tart with Macaroon Crust, German Chocolate Cake, Maple Streusel Coffee Cake Squares and Pecan Shortbread Cookies. There are even recipes for cookies, candies and bars that could fill holiday treat boxes for gift giving such as Marzipan Buckeye Bars, Salted Tahini Caramels, Sugar Cookie Cutouts, Russian Tea Cakes, Turtle Bites and Classic Cacao Truffles. The contest is over. Congratulations to Camille! A winners will be chosen at random. Contest ends on Sunday, October 13th at midnight, EST. US residents only please. Good luck! Loooove chocolate in practically everything, especially cake. Favorite desert is vegan banana ice cream!! My favorite dessert is usually anything with chocolate. I would love to try more raw desserts. The best dessert I ever had was during a raw foods class where we made fruit pie. Delicious! I love berry/rhubarb pies or galettes. I follow Vegan Heritage Press on FB. I follow Chic Vegan on FB. I follow Chic Vegan on Pinterest. I follow on Twitter @bankruptvegan. I follow VHP on Facebook. I follow VHP on Twitter. My fave dessert is vegan cashew ice cream. Delicious! I follow Chic Vegan on Facebook. I follow Chic Vegan on twitter. I follow Vegan Heritage Press. I follow Vegan Heritage Press on Twitter. I follow Vegan Heritage Press on Pinterest. I follow Vegan Heritage Press on Facebook! My fave dessert, raw and vegan, is No-Bake Pumpkin Pie Cookies. So good with the dates, pumpkin and walnuts! I can never eat just one, and my kids have been known to sneak a few as well! Caught in the cookie jar! Tiramisu is my favorite dessert but I also love chocolate turtles! My favorite dessert is key lime pie! Followed vegan heritage press on facebook. I follow CV on Pinterest. I follow CV on Twitter. I liked Vegan Heritage on FB. I followed Vegan Heritage on Pinterest. I followed Vegan Heritage on Twitter. Love Vegan pancakes! And they only take 5 mins to make! Already follow chic vegan on Facebook!